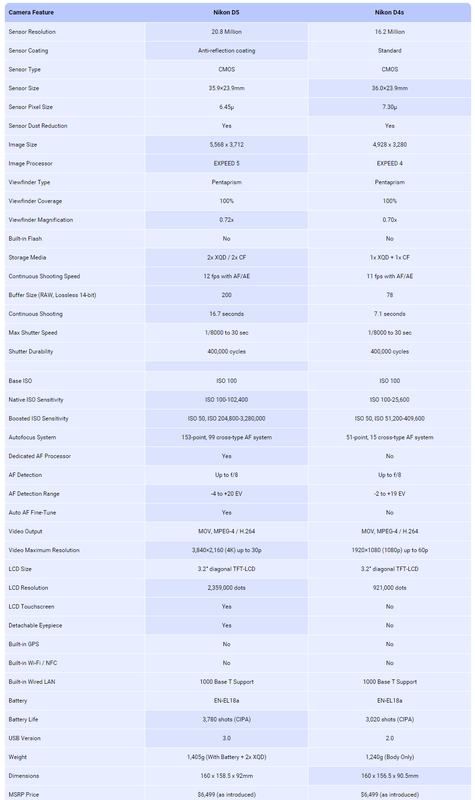 So CES is over and Nikon’s big announcement of the D5 is all over the place, I thought that maybe this would be a good time to review the the Nikon D5 vs Nikon D4s. The biggest changes have been t he new and improved autofocus tracking system with a 153 points, better focusing in low light and its expanded ISO capabilities. Ergonomically, the D5 is slightly bigger than the D4. The main command dial has been moved slightly and their is and addition of another function button to the left of the lens mount as pictured. In addition to those minor cosmetic changes, the Nikon brand logo itself is slightly different. The top view of the D5 camera shows some changes on the buttons. The dial on the left now has the mode and the bracketing button which makes more sense as these are often more readily used features than the layout on t he D4s. Another change is the addition of the ISO button near the shutter release which is really a nice change as this is something that sports and wildlife photographers have been clamoring for for some time. The rear of the camera has also undergone a transformation with additional rubber pieces for comfort and grip along with buttons. 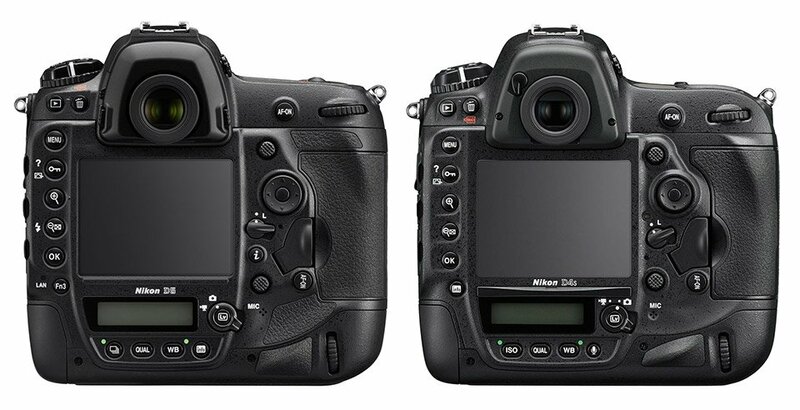 Nikon has added and “i” button which will allow for some programming and tweaks in Live View mode. They have added another programmable function on the side. The viewfinder eyepiece on the D5 is now detachable and has a different coating that the eyepiece on the D4s. 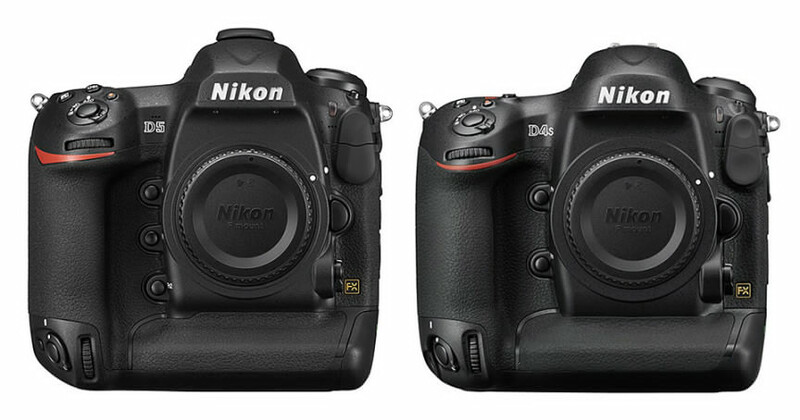 The first difference is obviously resolution – the Nikon D5 pushes it to 20.8 MP from 16.2 MP that we have seen on the last two predecessors. While the change seems to be small, in reality that’s quite a lot of data to push through once you factor in the continuous shooting speed of 12 fps. 4 extra megapixels translates to even more cropping opportunities, which is always useful to have on such a camera. In addition to the increase in resolution, Nikon has also modified the coating on the sensor – the D5 now has better anti-reflection coating, which should reduce ghosting and flare even further. With the change of the sensor also comes a change in the main processor. The latest generation EXPEED 5 processor is not only significantly faster, but it is also much more efficient, allowing the D5 to squeeze 3,780 shots from the same EN-EL18a battery that only yields a bit over 3 thousand shots on the D4s. In addition, the Nikon D5 ships with a brand new 180K pixel RGB metering sensor (the D4s has a 91K pixel RGB sensor), which coupled with the EXPEED 5 does a better job at tracking subjects during autofocus operation. The bottom line is that if you make a living with your camera, then the upgrades are well worth getting the D5 just for t he improved auto focus and the -4EV. For everyone else the Nikon D5 is probably not needed.